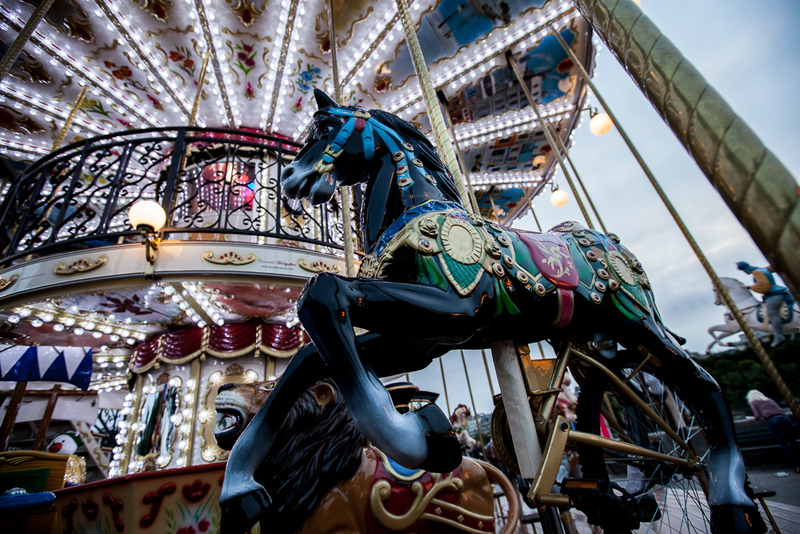 Always a romantic scene, the carousel, in Paris. I am reminded of my time in London in the late 80’s, spring of ’88 to be exact, of friend Sam Gaidemak’s song Carousel the lyrics starting with “horses have painted faces, on the carousel….” which he wrote and performed with my friend Lauren who had, and I am certain still has, a beautiful singing voice. Little girls & boys riding around, lovers holding hands next to one another as the horses go up & down to the music…this carousel is just across the Seine opposite the Eiffel Tower. I think the fisheye captures the circular nature of the spinning horses, with their painted faces, perfectly. Round & round & round, they go…..
Posted on Thursday, December 27th, 2012 at 11:56 pm. Filed under: Carousel, Paris Tags: carousel, fisheye, France, Paris	RSS 2.0 feed.